In 2014, Spring hosted a digitizing station for Asia Art Archive as they were making intensive efforts to care for Ha Bik Chuen (1925-2009)’s archive, and it was a wonder: people came in and leafted through the various articles, magazines, documents for hours, marvelling at the new insights Ha’s collection could reveal. 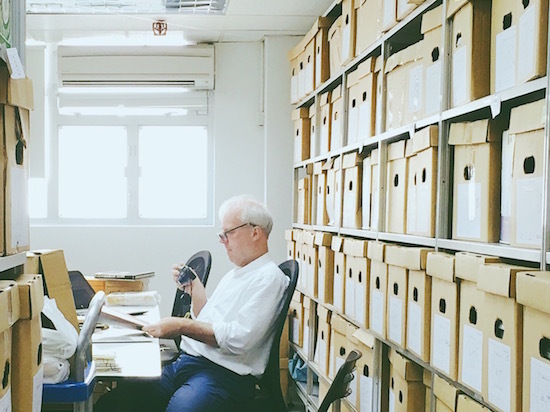 Now AAA has placed the vast archive in a temporary home in Fo Tan that is open to the public for research. Taking this opportunity to engage once again with Ha’s archive, we have invited art critic and curator John Batten to lead us on a dive into the treasure of the archive to create a display at Spring that opens October 14, and which will include Ha’s designs for Christmas cards, blueprints for his largest public sculpture in nearby Aberdeen, scrapbooks and diaries, shown alongside memories of Wong Chuk Hangs’ printing factories. Read more about the Ha Bik Chuen Archive.